Hi! I am happy to publicly release the Arduino sketches for amiibo cloning using the PN532 NFC module! Here I will provide a short manual on how to use them. If you want more detail, check the initial Create amiibo clones with Arduino article. Connect the NFC module to the Arduino. Download the modified Adafruit library and put it with the rest of your Arduino libraries. 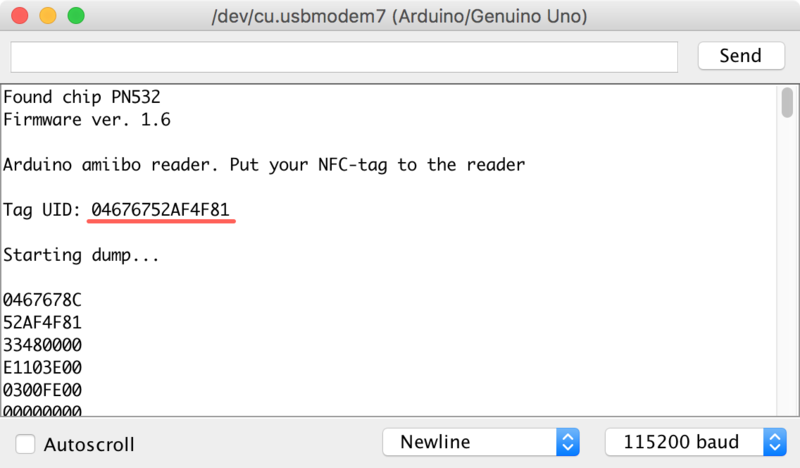 Then use Dump_amiibo_PN532 Arduino sketch from my repository in order to get the NFC tag UID. 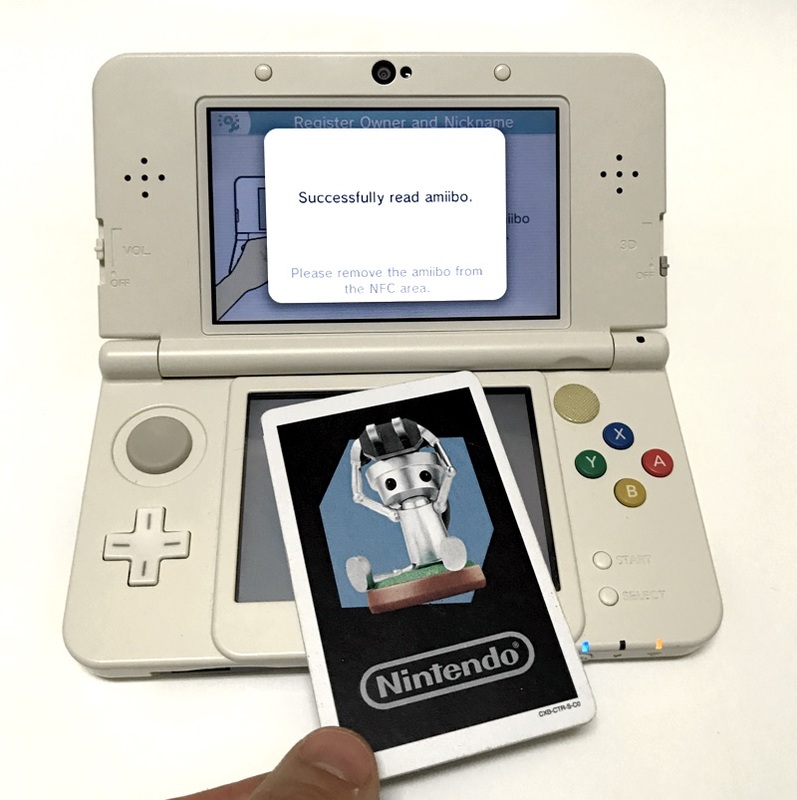 Again, use my Dump_amiibo_PN532 Arduino sketch and put the amiibo figurine on the reader. In a few seconds the dump will appear on the screen. Just copy it into a hex-editor and save the resulting file. In this example I called mine Chibi-Robo.dump.bin. Go to https://games.kel.mn/amiibo, pick your dump, the key, then specify the UID of the blank tag. Press “Submit”, the new dump will appear in a popup window! Now this code should be pasted into the Write_amiibo_PN532 Arduino sketch. After you see the “Write process finished! Now please take your Amiibo card away!” message it is safe to take the tag away. The Adafruit library is not perfect and suffer from some issues which I was unable to fix. First and the most noticeable one is the performance issue. While it takes just a second to dump or write a tag with RS522 module, it takes whole nine seconds with PN532. Writing is even slower! It takes 17 seconds to write a tag. And please stand still during that time because it is impossible to check whether the writing to a single page was successful or not. The checking procedure simply doesn’t work as intended, always reporting success. So please be careful and check the written tag with Dump_amiibo_PN532 sketch after writing to it. If you find it empty, try to write again. And again. It should work eventually. I want to thank all the donators who helped me to buy the module and tags for test and who participated in the beta test to fix some ridiculous bugs! Big thanks to my patrons at Patreon! Guys, you’re great! Thanks for your support! And I also want to say thank you to all the people who come here to the blog every day! You really helped me to move on and continue my work on this project. But they will NEVER be identical since each Ntag215 has its own UID and each Amiibo has its own UID. So I’m just asking you to explain your loop. Seems like you don’t understand the point of the whole procedure described in this manual. You have a dump with a certain UID and you have a blank tag with a different UID. You convert the dump using the online tool specifying the dump and the UID of the blank tag to make the dump compatible specifically with your blank tag. 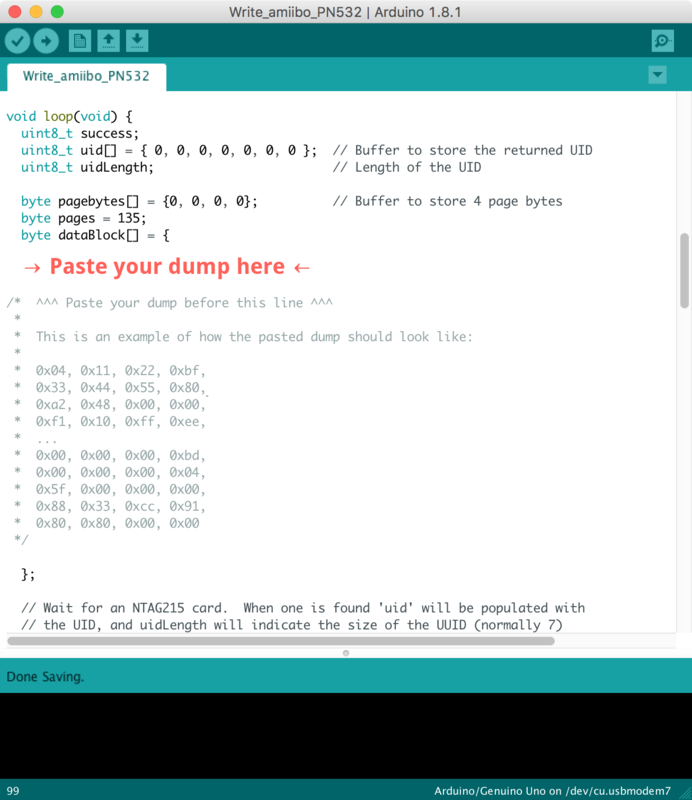 Regarding your web application Online dump editing tool v1.2, I imagine that it is from Amiitool. Having seen your github repository I did not find anything on Amiitool. Thank you for everything ! Thanks to you I think to be done with the part Tag! You do not want to share your sources? You can also simply save the webpage at https://games.kel.mn/amiibo to get the frontend source. The only thing I can not share due to security reasons is the backend configuration and scripts. Well, he dumped the amiibo with his corresponding ID. I’ll admit that I’m blocking, do you see the worry? in fact I understood, but I do not know how to solve the problem! Sorry, Yave, I can not assist you with this code. You should better create an issue on GitHub to contact the author directly. In any case I thank you for your help! We have the same passion for consoles / video games and programming! I wish you a very good continuation, great job you did! Thanks a lot! Wish you luck with your project! I would like to be able to display the Character ID and the GAME ID of each scanned Amiibo, thus lighting LEDs, playing a sound etc. 😉 But different for each Character ID. I thought amiitool would do it but no. Or most certainly I did not understand! And I was not sure that the script was using UIDs? So, that does not interest me at all, it’s not dynamic. 0x0	0x2	Game & Character ID	First 10 bits are the Game ID and last 6 bits are Character ID. It is for ESP8266 modules, not standard Arduino, but you might be able to port the needed features. It is 100% able to distinguish the amiibo characters. For the last part of my answer, it is a translation error sorry I am French;) I do not try to erase my friendibos, we can not with nTag. I wanted to say that I can not correct dump a complete friendibo, but especially the UNIQUE ID to recover the DATAS, for me it is the most important. The uid does not really matter from what I understand. > but especially the UNIQUE ID to recover the DATAS, for me it is the most important. The uid does not really matter from what I understand. You understand it wrong. The UID is the UNIQUE ID. That is also not right. The first block contains just the first half of the UID, nothing more. Such data as Amiibo name, stats and so on are stored further in the dump and are encoded. I thought I understand that the UID is unique to each Amiibo and not to each model of Amiibo?! UID = the UNIQUE serial number for each Amiibo Link, so for unique summary and related to its owner. So, I’m pretty surprised of your answer. If you do not see any material difference in our cards, that can only be the worry! I’ll let you know as soon as possible. I am very grateful for your explanations and your help, really thank you, I love this kind of fun project. The UID is the only really unique thing for a tag and this helps the console to distinguish between amiibos. So if you have written the same amiibo to two different tags (of course performing a necessary encoding process, which is also based on UID), the system, say 3DS, will be able to understand that these are different tags and will handle them separately. By going through the SPI everything works perfectly! // If using the breakout with SPI, define the pins for SPI communication. Regarding the Amiibos, I read so many things on the net … Nobody seems to agree, which has troubled my thinking! Now that I know how to get a full Dump, I have to test it and make sure it’s clean! Yet amiitool is supposed to decrypted them. So, at no point in all this I do not see the first 10 bits are the Game ID and the Character ID etc. I’m glad SPI worked for you and thanks for posting the pinout of your module. 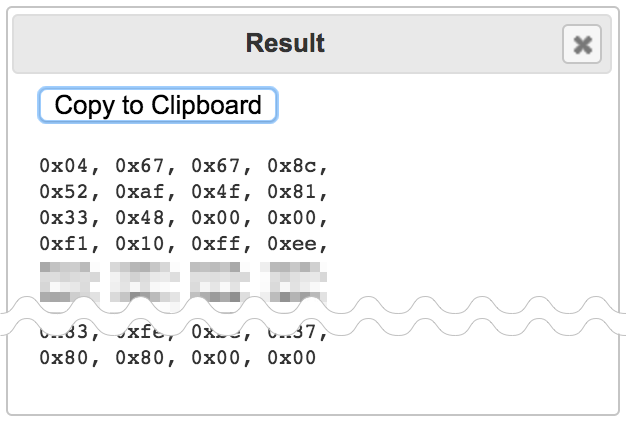 The result on the screenshot you provided looks like a valid decrypted dump for me. What is the issue you’re experiencing now? Do you have any troubles with hex? What did you expect to see after decoding the dump? I used https://github.com/konstantin-kelemen/Adafruit-PN532 it well and yet the 1st Offset is not Dumper. Unfortunately I haven’t used the Adafruit shield before, and the picture doesn’t really say much to me. What I can recommend is to try to use it in SPI mode in case the board supports it. If nothing helps, could you send the dump sketch output, I’ll need to take a look at it? I did not find the equivalence in terms of schemat for the SPI mode with my Adafruit shield, sorry! Hi, the output looks weird but you can easily recover the data from the first bank, since you already have the most part of it in the UID. The first 4 bytes you’ll get is the data in the first bank (in your case it is 04C15914). When you execute your code you have no errors, you that it comes from the fact that I use a control card different from yours (Adafruit PN532) I do not see any material differences between mine and yours. So, I’m blocking and I do not know how to get them clean … Do you have an idea? especially since I scrupulously respect your code and I use the library that you have modified. > Why the 1st 4 bytes are not calculated in the dump while they are for UID? Sorry, but I have no idea why this is happening. I advice you to try the original Adafruit library, possibly there have been some recent fixes for that. > I do not see any material differences between mine and yours. Right, our NFC modules use the same chip. But mine usually works with SPI protocol which might have been implemented differently within the library. Again, try the official library for dumping purposes. > So, I’m blocking and I do not know how to get them clean … Do you have an idea? Are you trying to erase the tag? If so, I’m sorry to disappoint you, but that is not possible with Amiibos. First of all thank you for your sharing! I have a PN532 Adafruit, and when I dump my amiibos I never recuèpre the first page 0x0 I have the error message, so I’m not a proper Dump. Will you have an idea? Knowing that this 1st Offset contains all the interesting datas, including the ID, NAME of each amiibo and I do not see at any time in your code the decryption via the private key. In short, how did it go? The dumping process is fairly simple and does not require any specific keys or something.